EDMONTON - The sister of Alberta Premier Alison Redford says she has never pulled strings to help someone get faster or better health-care treatment. "I've not been involved in adjusting wait lists of any sort, nor have I been involved in expediting access for anyone," Lynn Redford testified Tuesday before an inquiry looking into alleged queue-jumping for well-connected Albertans. 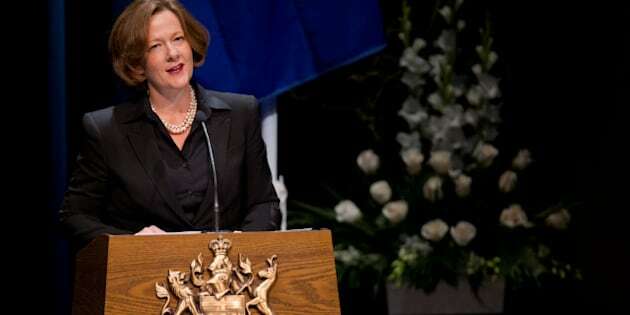 Redford was testifying about her time as director of government relations at the Calgary health region before it and all other health regions were folded into the Alberta Health Services superboard in 2009. She told inquiry lawyer Jason Wilkins she never received requests from politicians or anyone else to deliver fast-track care for prominent people. "I didn't receive calls like that," she said. "You don't recall a single one?" prodded Wilkins. Redford also said she didn't know of anyone else who has received or facilitated faster care. The inquiry, under the auspices of the Health Quality Council, was ordered earlier this year by premier Redford to investigate a memo circulated by the former head of Alberta Health Services, Stephen Duckett, in the spring of 2009. The memo said "it's not uncommon" for health officials to get requests to give preferential treatment to VIPs and said such behaviour was unacceptable. "What was your first impression or first thought about the memo?" asked Wilkins. "My first impression was that it was good," said Redford. She added that given that she didn't know of any queue-jumping, she assumed the memo was Duckett's way of taking a proactive step to establish boundaries. "My impression was this was one of many types of things that he (Duckett) was getting his head around, if you will, and wanted to just make clear what his expectations were." Redford, who is now an executive with Alberta Health Services, said her government relations job was to help all politicians and constituents with questions about where to go for help — but she stressed it was a purely informational role. "I either answer what I can or tell them they should call our patient representative office," she said. "I don't believe that's preferential access. It's just navigation and providing information." Earlier Tuesday, former health minister Ron Liepert testified he had heard media reports of queue-jumping when he served in the job for almost two years starting in the spring of 2008. Liepert said he did not know if the reports were true, didn't ask anyone to look into them and didn't know if anyone in his department was investigating. "I don't recall ever picking up the phone and phoning Alberta Health Services and saying, 'There's an accusation in the letter to the editor. Tell me about this,'" said Liepert, who is now retired from public life. "I didn't see that as being my job." Liepert said he recalled the morning in November 2009 when he heard on the radio that members of the Calgary Flames hockey team, as well as their families, had jumped the queue to get vaccinations for the H1N1 flu virus. "I was shocked," he said. "It just wasn't part of the protocol, so I was really surprised that that had happened." Liepert said he took a hands-off approach to the problem because Alberta Health Services, also known as AHS, had approved the shots. While the minister and the Health Department set policy, AHS is an arm's-length department responsible for day-to-day care in hospitals and clinics. While AHS is ultimately responsible to the minister, its staff report to an AHS executive and board of directors, noted Liepert. Two AHS staffers who OK'd the fast-track treatment for the Flames were ultimately dismissed. Liepert said he never helped any person get faster treatment and was not aware of anyone else asking for such help. "I clearly would state that I have no (knowledge of an) instance of any of that taking place." Also testifying Tuesday was Brian Hlus, who worked in the now-defunct Edmonton health region. Last week at the inquiry Duckett said he had heard secondhand that Hlus was a "fix-it" person who could get people bumped up on wait lists. Hlus said he never helped people jump the queue and was not aware of any patients getting favoured treatment. "Do you have any idea how Dr. Duckett formed the opinion you might be a person in a position to make discreet adjustments to wait lists?" lawyer Michele Hollins asked Hlus. "For a year and half since I first heard (it mentioned) after (a Duckett) speech I've been trying to figure that out, and I don't (know)," he replied.